a patient, and to label the sample collection container in the presence of the patient. Producing specimen labels at the patient bedside and encoding patient identification in a barcode satisfies both The Joint Commission’s NPSG and Health Insurance Portability and Accountability Act (HIPAA) requirements. 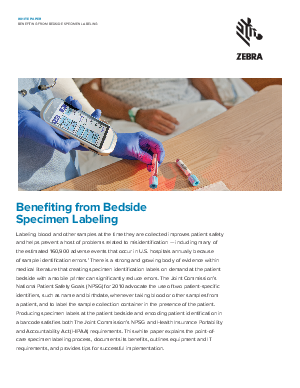 This white paper explains the point-of care specimen labeling process, documents its benefits, outlines equipment and IT requirements, and provides tips for successful implementation.